2 weeks ago we woke before sunrise, set out down the dirt road just outside our house in hopes to hike Teocalli Mountain. Heavy, dark clouds loomed in the distance making it uncertain as to whether we would summit but we set out anyhow. If you’re familiar with Colorado weather then you know it can change in an instant and you can experience all 4 seasons in one day especially on a peak. Teocalli stands at 13,208 feet above sea level and had been penciled in on our ‘mountain bucket list’ for many passing suns. If you’ve visited the valley it is likely you’ve seen Teocalli as you’ve driven into town. It sits of off I-135 with a bold presence and pyramid like shape. The peak of fall and forecasted calm weather finally lured us embark on the 7 mile journey with an elevation gain of 3,000 feet. The clouds moved quickly with the wind and dawns first light shone so bright in front of us. All of the trees vibrant colors were even more illuminated and all of the earth seemed to awaken all at once. The crunch of foliage beneath our feet, the fragrant scent of dewy plant life, and the faint whisper of wind all play fresh in my fondest memories of that morning. The blue skies cleared us to continue our early autumn adventure. It was so bright walking toward the sun I couldn’t see when I snapped the photo above but I love how it came out. After traversing the grassy foot hills the defined trail leads straight up the face of the mountain before plateauing (a bit) just below the cliffs. The views in every direction are absolutely breathtaking. Below are Castleabra, Castle, and Conundrum peaks encompassing Twin lakes. Once the cliffs are reached there is some light scrambling required to reach the summit but very moderate. We encountered 6 other people near the top who were all in their late 60’s. We shared in our gratitude for such an incredible day and our privilege to be doing such a thing. I sure hope I’m still climbing mountains after 60! And 70! To my delight there was a log book at the peak! I love to put thanks on paper and relish in other people’s stories who hiked before me while I wonder who might read my words. After hiking many mountains I came across my first log book on Mt. Axtell (it was really a jar with scrap paper) and since have come across something like it on every hike. The person that hiked this one up to Teocalli did so because there was not one there the first time he had hiked it and he had wanted his dog’s name to be in a log so they ventured up again. For the love of dogs! Styx obviously had to have his name written in as well. The fall foliage from the peak was nearly unbelievable! 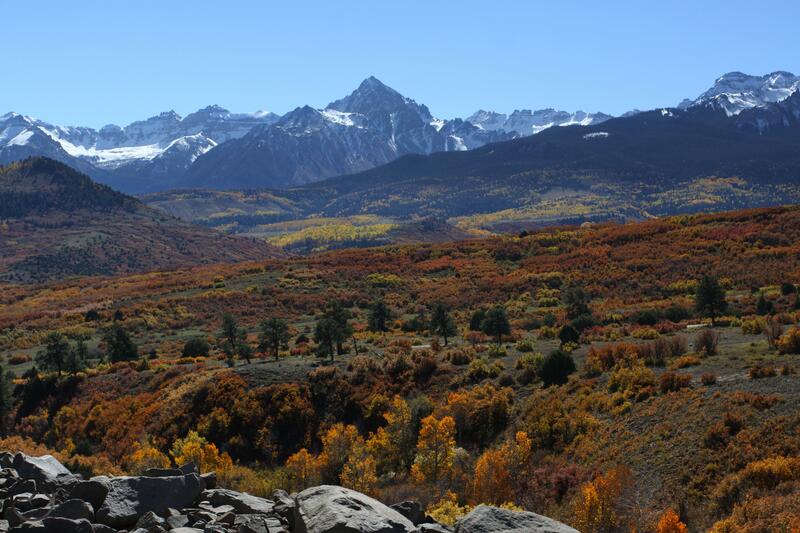 A sea of changing aspens, dark green pines and amber grasses lined the Brush Creek Wilderness. A valley I hadn’t yet witnessed from above. A hawk and a bald eagle circled above and at times just floated on the wind. Hawks grace me with their presence everyday, in fact I can’t remember the last time I went a day without Hawk. If we are connected on Instagram you’ve probably seen sneak peaks of my other fall photos I am working on sorting through. I didn’t want to overload you all in one post so I will continue working on uploading the captures I took throughout September. It has been a magical fall season here on the western slope of CO and I look forward to sharing it all with you! Is fall showing itself where you are? I would love to see! Share with me below or tag me in your photos on Instagram! Remember you can Pin these photos for travel inspiration and more! See Teocalli covered in snow, here. I have only spent two autumn’s in Colorado but that might just be the prettiest place in the world for fall color. 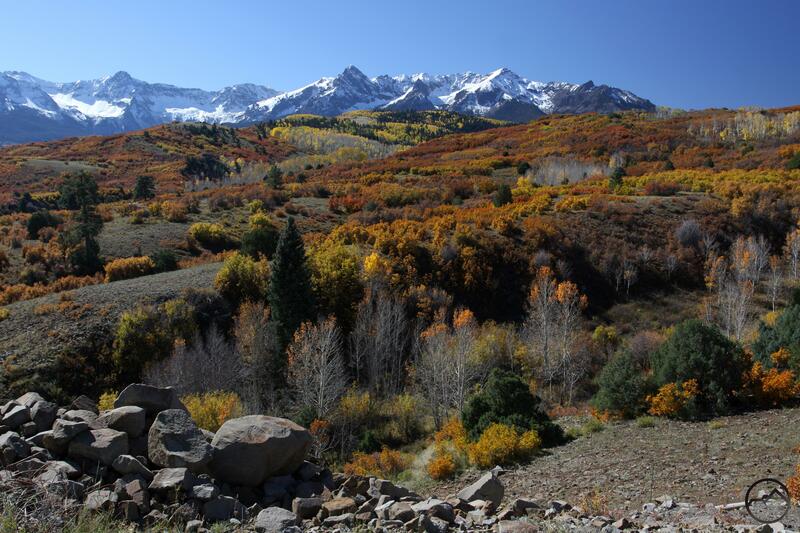 The east may have more diverse colors but the vast stands of aspens in Colorado’s mountains are tough to beat! The Dallas Divide, in particular, never disappoints. Regarding fall color where we are, we just had a nice dose in the eastern Sierra! This fall has blown me away! I’ve never experienced a fall season quite so grand. I have heard great things regarding Dallas Divide, I will have to check it out. We have our first snow today so thats probably the end of the leaves but I’m always looking for new places to explore. Thanks so much for stopping by and sharing your insights! I look forward to checking out autumn in the Sierra’s! These are from the Dallas Divide from a few years ago. The whole area is amazing!